Charlie and the Chocolate Factory (oh I wish it were the original!) playing in J Hood Wright Park this Friday! Come on out for an evening of family fun on the lawn of J. 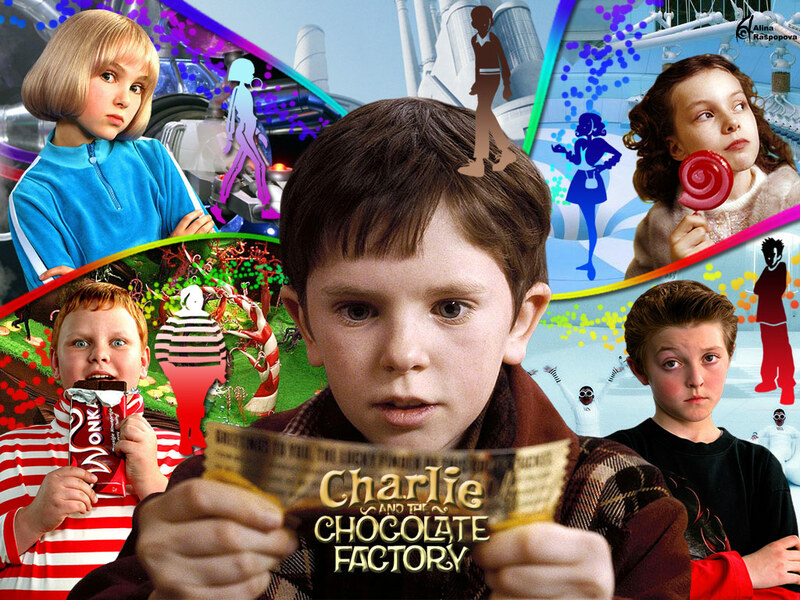 Hood Wright Park, Friday July 31st at 8:30 p.m. Watch Charlie and the Chocolate Factory, starring Johnny Depp as Willy Wonka, with your friends and neighbors under the stars! Bring a blanket. An update of all of the fitness and other interesting programs going on in the parks nearby- all FREE!! Now until August 5th, mark your calendars! National Night Out, America's annual night out against crime. 34th Precinct - 3:00 - 7:00 p.m. at Wallenberg Playground on West 189th Street & Amsterdam Ave.
33rd Precinct -1:00 - 6:00 p.m. at Wright Brothers Playground on West 156th Street & St. Nicholas Ave.
For more information about National Night Out, contact your NYPD precinct Community Affairs officer. A new and healthy event is on the horizon in nearby Harlem. THe New York Road Runners have been working hard to encourage children and adults all over the city to become more active and are focusing a lot of their efforts in Harlem where they feel their help is needed the most. An event coming up 0n August 22nd is the culmination of a lot of hard work and will hopefully become an annual community event! Help spread the word about “Healthy Eating & Living” in Upper Manhattan. New York Road Runners, in partnership with HARLEM WEEK and The Greater Harlem Chamber of Commerce’s Healthy Eating and Healthy Living Initiative, is pleased to offer several special opportunities to those in Upper Manhattan to get fitter and healthier this summer. Saturday, August 22. Open to people of all ages and abilities, these events are part of HARLEM WEEK’S 35th anniversary. Prepare to walk two miles or run 3.1 miles, or just enjoy an hour or two of stress-relieving activity with other health-minded people at four relaxing yet invigorating weekend group sessions: July 26, August 1, August 8, and August 15. The activities are free, and there is no pre-registration. NYRR membership fees, race entry fees, and donations support NYRR running programs for nearly 100,000 kids per week, including 6,500 in Harlem. Learn more about NYRR. For more about The Greater Harlem Chamber of Commerce, visit www.Harlemdiscover.com. Today was the big day for lots of city athletes, the 9th annual NYC Triathlon. It's an Olympic distance Tri which means its a 1500m swim (nearly a mile), 40K bike and a 10K run. Whew. I was a volunteer on the early, early shift- 4am to 9am handing out timing chips and making sure they put them in the right place (ankle). It was brutal getting there at 3:45 but I had a great time and met some really great people. As a volunteer you get guaranteed entry to next year's race which is a big deal because the race usually sells out in under 10 seconds once online reg opens! Insane. Anyhow since chip distribution was located right along the rivers edge, I got some great shots and had a front row "seat" to the swimming portion. It was intense and somewhat gross (we saw the trash floating around early in the morning after a few minutes of rain) but definitely inspiring. Here are a few of my favorite shots from the day, gotta love old George posing upriver. Check out my flickr page for more. Congrats to everyone who gave it their all today. It was really inspiring. A few weeks ago I entered the weekly drawing on a running site I frequent called Runners Lounge. They do a weekly giveaway and they were having people create their own granola mixes on a new site called MixMyGranola and submit them. I picked all of the things I like the most in granola (berries, bananas, walnuts, etc) and gave it a clever name and I won! Well I won a $20 gift card to the site and I just received my granola this week- its DELICIOUS!! I ordered a berry mix for the fiancee and a French Vanilla granola mix with Vita Cherry powder and lots of yummy berries, bananas, walnuts and pumpkin seeds for me. Yum, yum, yum. I just wanted to share because I know I get sick of eating the same things all the time and this is a fun way to change things up and get exactly what you want. They even give you the nutritional value of your mix as you add each ingredient. It helped me stay away from adding the candy :) Enjoy. Have a wonderful weekend, and GOOD LUCK if you're doing the NYC Triathlon tomorrow! I'll be out there as a volunteer writing race numbers on everyone's hot bods and handing out the timing chips. 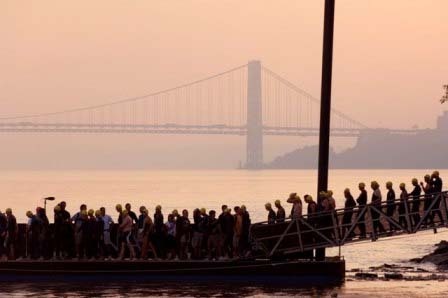 A friend of mine is doing the race so he got me into volunteering for it and now I'll have guaranteed entry for next year (if I can stand to get into the Hudson). Had to share this fantastic picture my cousin took on tour in Afghanistan. Forget email, forget twitter, welcome to Google Wave. I haven't quite figured it out yet, but it seems like Google is taking us forward again in the near future. Also receiving rave reviews, Fort Tryon Park and Riverside Park, though no one really mentions areas in Riverside this far north...they're probably scared of the hills. Super busy start to the week after being away all weekend soakin up the NJ sun. I'm in the midst of becoming a certified SCUBA open water diver, and the late night classes are taking a toll. I'm not a late night kind of girl and class doesn't end until 11:30pm down at 43rd St. Needless to say with the shuttle bus crap I'm taking cabs home... there goes the discount on the class I got for being a member at the pool where we practice! I've seen the ads on the subway for Governor's Island, but as a Northern Manhattanite I just haven't made the trip down there yet. I've been reading about the free bike rentals on Friday afternoons and I am just waiting for that Friday off with nothing else to do (right..) but here's a run article by Brian Fieldman about his adventure run on G.I. It sounds like fun! I remember my first run all the way around Manhattan last year when I was training for the NYC Marathon and how exciting it was as I curled around the bottom of the island and caught glimpses of Lady Liberty, followed by the great bridges and on and on.. it certainly kept things exciting, at least until I hit that wasteland we call the East Side. zzzz. Well it's a beach weekend for me, catch ya next week! Have a great weekend! A friend of mine showed up at work with a little colorful bag that almost looked like a change purse or wallet and reached in and came out with a cracker and some nuts! I was expecting $$ or a receipt, but it turns out the bag is a "Snack Taxi"- a reusable bag to replace plastic baggies used for snacks. I LOVE it. She directed me to a great website for all of your green carrying needs! Reusable Bags has everything you could imagine. Forget those thin crappy bags for produce (which I skip anyway except when buying lettuce or green beans or other small/wet things), they have light canvas ones! I love it all. I have plenty of the large reusable bags (don't we all?) but I was happy to see so many other fun options for eliminating plastic bag waste. Good Morning Washington Heights/Inwood! Happy Hump Day. Anyhow, I noticed that there were port-o-potties placed on the other side of the park and snapped a picture from across the sidewalk, but didn't dare get any closer because of the stench and the flies. Wow, this is a serious problem. The parks dept last inspection was April 30th and it was deemed "Acceptable" but nowhere is there mention of the lack of facilities, fountains and handwashing sinks! complaint to the parks commissioner and 311 and will keep on this! Til then... pack some water and plan on a trip to Starbucks to pee if you don't live close enough to run home. Note to self: Carry camera more often when wandering the hood. I always have my blackberry which has an okay camera (the pictures of the talk show filming were with the 'berry), but I see fun stuff all of the time that I need my real camera in order to fully capture. The problem is that most of my adventures in the hood are while running and I definitely don't carry it then! I'll try to get better at it when I'm wandering around at slower speeds. The cats are snoring and I'm zonked from a run down the greenway to 145th to use the track at Riverbank State Park for a workout and then running home back along the greenway to my cozy abode. I don't have the mental capacity to figure out how far I ran, but any run that ends with me scrambling up those hills from the GWB to home is a tough one. Definitely time for bed! Just a little picture from the hood from a day that I actually remembered my camera. It was taken along Fort Washington Ave around 190th St.
No more trekking down to Central Park for group runs!! 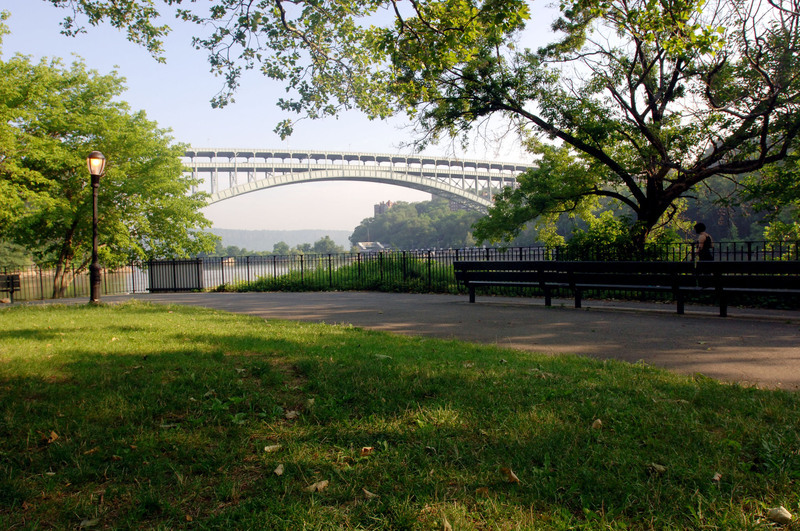 Did you know that there is actually a running group right here in Inwood? The Inwood Hill Running Club has been around for many years, ever since a runner was killed in Inwood Hill Park in 2004. We meet twice a week for group runs on Thursday evenings and Saturday mornings all year round. Thursdays we run a hilly 4 mile loop around the hood and Saturdays we run anywhere from 6-9 miles either along the greenway to Riverbank State park and back, or up to Riverdale for a partial trail run or anywhere else when we're in the mood. We've even taken Fairway trips, ending our runs at the 135th Fairway and doing a little grocery shopping! We average at a pace of around 8-9 min per mile and are always looking for new faces. We meet at the Isham St entrance to Inwood Hill Park, Thursday at 6:30pm and Saturday at 9am. Hope to see you there! What were they filming this afternoon at the corner of Broadway, Dyckman and Riverside??? I couldn't quite figure out what the heck was actually going on. There was what looked like a TV talk show set right by the subway station entrance at the corner of Riverside and Dyckman and Broadway. 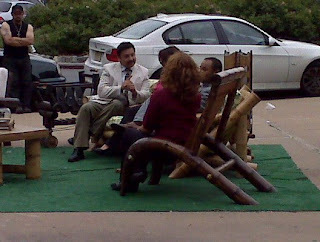 It was hard to hear what they were discussing but it was definitely in Spanish. There was a very odd looking "waitress" waiting on the side with a tray of espresso. She was more than likely a man at an earlier point in her life and had a very striking appearance. We didn't wait around too long, but it was definitely an odd sight to see the chairs and coffee table all set up on a little mat of turf on the sidewalk with the cars going by right next to them. 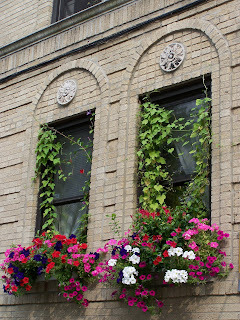 I enjoy a nice little box of flowers outside my window during the warmer months. I wish I could figure out how to rig up boxes from my living room and kitchen windows, but the ledge is slanted and I haven't found anything that I trust to hold the boxes from crashing down 3 stories. So, I'm stuck putting them outside the bedroom window on the fire escape. Its fine, they get good light and look pretty and aren't really in the way. My cats enjoy sunning themselves and looking out at my flowers (or so I like to think). After a quick trip to the grocery store I came out and noticed that the sun was heading down so I wandered over to Chittenden Ave at 187th and WOW! What a great sunset. I also took a shot of a charming little building with the greatest of old windows. These must have been all over the hood in the old days. They are the same type of windows found in Hudson View Gardenswhere all of the people have to put their AC's sideways to fit the skinny windows. As I strolled around tonight in the cool, gorgeous evening I was reminded once again how much I love this area. And then I remembered I bought ice cream and it was still in my bag so I had to scurry home. Enjoy! What a great view from this place! Chittenden Ave is really full of little gems. Could it be?? The long awaited opening of the Twin Donut Plus in Inwood on 218th and Broadway, which has been teasing me for years has finally opened its doors and its patio!! There was chatter last week about the "now hiring" sign in the window at The Streets Where We Live and BAM! today it opened its doors! I ran by tonight on my way up to Van Cortlandt Park for a speed workout. Too bad I didn't pass it on my way home....yum! It looked like the place was pretty busy considering its quiet opening. 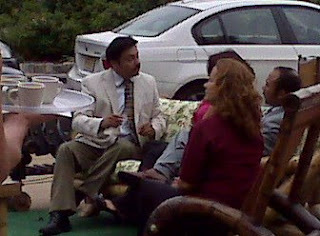 There were people out on the little fenced off patio area chatting and drinking coffee and nibbling on goodies. I'm excited to try it out and give a review ASAP. The neon sign glows "OPEN 24 HRS" which is intriguing and tempting. Perhaps I'll make a morning run up that way and end with a delicious treat before hopping the train down a few stops to home. I've run with a number of things in my bag, but not a donut and/or coffee! So it's official- Twin Donuts Plus is open for business! Review coming soon! *Photo taken from the official, but not entirely functioning website of Twin Donut.